Hello friends, hope you are doing good. So today I am feeling lazy and as we all know if developer feeling lazy its mean some automation is coming. In this post, we will discuss Continuous Integration ( CI ), Continuous Delivery ( CD ), Continuous Deployment ( CD ), and how we can implement in case of Android applications. This is my favorite part. Why we need Continuous Integration ( CI ), Continuous Delivery ( CD ), Continuous Deployment ( CD )? For me, there are three reasons one as an individual, second as a developer who is working in a team and third is a business perspective. 1. I want to be a lazy developer. 2. I want to increase productivity by saving time from repetitive tasks. As I am writing, my list is growing and I am feeling that will be boring for some of my readers. So, I am going to next reason. I am managing country base code by using flavors in Android Studio and development environment by using Build Variants. Now as my code base is getting large Android Studio performance is really poor. Sometimes that took 10 minutes to change a flavor and build environment. Then APK generation took around 3-5 minutes. A lot of time my Project manager come to me and ask me. Can you give us country3 stack build because API team fixed some bugs so we need to check? There are hundreds of other reasons and I need to give a build to QA. So I need to stop my work, if I am in between of a task, I need to do a git stash and then check out the last branch of that specific country. Then need to change variant and after that generate a build then send to QA team. So that takes some time around one hour. After that, I need to give more 15-30 mins to get my focus back. I really want to stop this but that is growing as we are adding more features. In the end, there is time comes when I feel maybe we need to hire a one person only to generate a build for QA team. So I decided I will do all this process automated. As a conclusion, I implementedContinuous Integration ( CI ), Continuous Delivery ( CD ), Continuous Deployment ( CD ). Now my builds automatically deployed to fabric for QA without me and also we published our apps directly to play store on a beta channel with one click. I implemented this to save mine and my team time. My team is more productive to implement more feature in less time. There are many other perspectives which I am going to skip now. In this process, I learn a lot of things which I know theoretically but I am not able to convince my team member’s or management of all these good practices. After this, I figure it out what is agile and why these things are really important. I know this is not a blog on agile practices, due to that I am going to make this shorter. I have a lot of respect for everyone knowledge or skill but In my opinion, Agile is 70-85% is dependent upon development team if your team is not confident to deploy new features in minutes then I don’t think so you are in a good agile environment. Your team should be 100% confident and always ready to deploy which is only possible if you have good code quality with unit tests and proper CI, CD, CD pipeline. Maybe my comment for some developers is useless but that is ok maybe one day you are able to relate all these things together. So, for my readers below is my plan for this case study. What is Continuous Integration ( CI), Continous Delivery ( CD), Continous Deployment ( CD )? For this whole case study, I will use git repo Android-CI-CD-CD. If you already know Android development with Android studio, git, and Gradle that will be good. Otherwise, you need some extra effort but as a whole, this series will be helpful for everyone who wants to know what is Continuous Integration ( CI), Continous Delivery ( CD), Continous Deployment ( CD ) and what type of benefits we can get from this. What is Continuous Integration, Continous Delivery, Continous Deployment? First continuous does not mean some process is always running in execution. Here we can say continuous mean automation. Any time any change will occur automation should start the process without human intervention and validate all new developer changes. Now it’s time start our discussion about Continous Integration. Now maybe you have a question. Who will validate developer changes? To validate changes developer need to write unit tests. Tests which validate their program functionality. Some teams are using Test Driven Development to make this first step more powerful and trustable. Source control system such as Git is a really powerful tool. That will take care of conflicts between team member code changes as they try to push code. They need to fix manually if some conflict occurs. As push is done then we need to use some Continous Integration ( CI ) server like Jenkins, Bamboo, TeamCity etc. 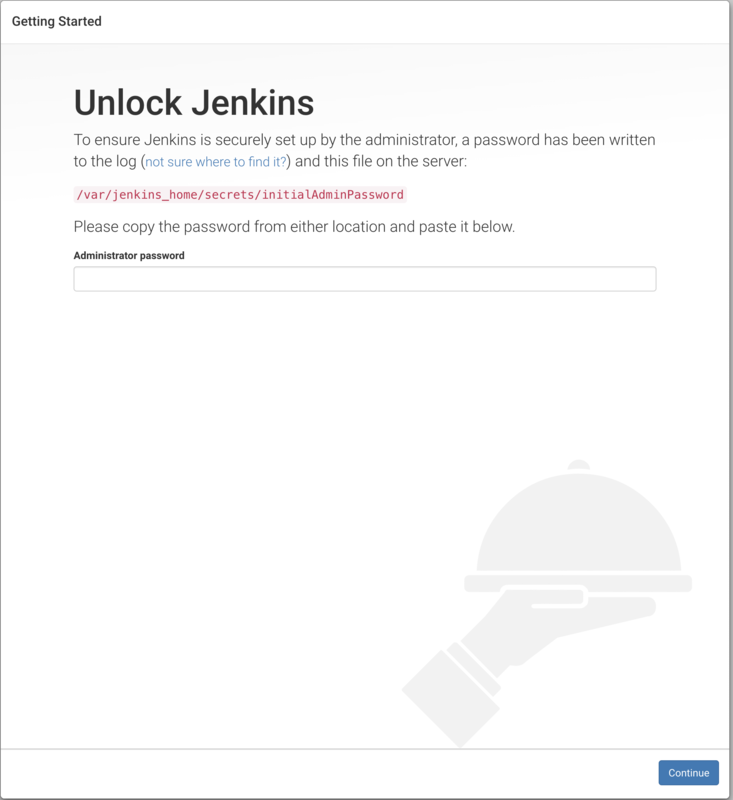 In this post, I am going with Jenkins. Jenkins can do polling on a source control system. If figure it out any issue can send notifications. Jenkins can send build and reports. Instead, Jenkins is the main power of our Continuous Integration ( CI), Continous Delivery ( CD), Continous Deployment ( CD ). On the other side some source code repository hosting like GitHub, they give us some power to make our Continuous Integration ( CI), Continous Delivery ( CD), Continous Deployment ( CD ) more powerful. Like they provide us to notify Jenkins about the change. I think that will be enough for Continous Integration, remaining things I will show you practically. Once Continous Integration does a merge of an isolated developer changes into a whole codebase, after that this phase start. This sometimes called CDP continuous delivery pipeline. This phase duty is to take care of the whole code base should be able to provide a final end product in working form. In this phase mostly we have integration tests, functional tests, and acceptance tests. Also, there are some reporting, for example, unit tests reports, code coverage reports or any other type of report we mostly generate here. If you have any code quality matrix you can implement in this phase. After that we have artifacts. Means a runnable product which is saved in some place. In our case, we will save our APK on Jenkins as an artifact with the proper versioning system. Up to this point if everything is good we can send this deliverable to our QA team for testing by using Email or any service with release notes. This is the last step of a continuous delivery pipeline. As our CDP proves us everything is good so now we can deploy our application into a product. This last phase is called a Continous Deployment. Mostly, this phase will take a very long time to mature in any organization. So most people do manually or sometimes companies deploy their applications as canary or beta up to 10% of their userbase. In our case, I will take this step as an immature so I will show you how to deploy APK on to play store beta channel. Now in Git, we have a really awesome feature which is called git hooks. I already share with you about this in Continous Integration ( CI ). It’s time to show you the power of git hooks and how you guys can use in your daily development. Ticket Number – Description minimum 20 characters. It’s time to show you how we can implement that feature in our case study. In project directory -> .git -> hooks. Here I am going to write my script into commit-msg.sample file to implement commit message format validation. Once you will save above script into file commit-msg. That will start validation. Remember, you need to remove its .sample extension. As you can see in above image. Once any team member gives a wrong message. He is not able to commit. Now it’s time to give a proper format message. Now as I gave a proper message. Git will do a commit for me. So now we can celebrate, we know what is git hook :). I want to show you one more very useful hook. Which will run the unit tests before Git Push. For that, you need to write a script into file pre-push.sample. Remember, you need to follow the same steps which we followed in commit-msg script to run successfully. After adding this script once I will do a push. 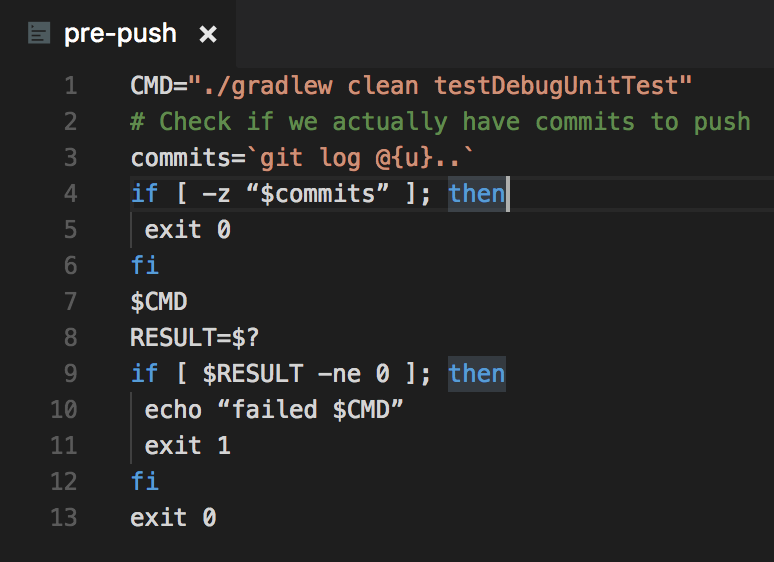 My git hook first runs a Gradle clean command. After that, this will run a unit tests. Currently, in our project, we have only one unit test. Which I am going to write to fail. So you guys can see how this hook will work. 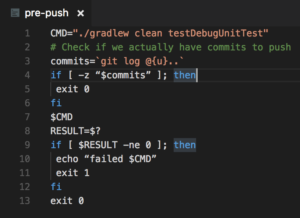 Now I tried to push our code on git with this test. As you can see. Your push will automatically terminate as test failed. Now, its time to fix this issue and push again. Now, this time our code successfully pushed into our Github repository. Those who are doing the second time I will recommend you guys try to use Docker image for the installation. If you never work with docker before this. Do not take tension that is really easy especially in our case. Only follow the steps which I am going to share with you that will be enough. No need to start learning docker. After that, Now I have two options. 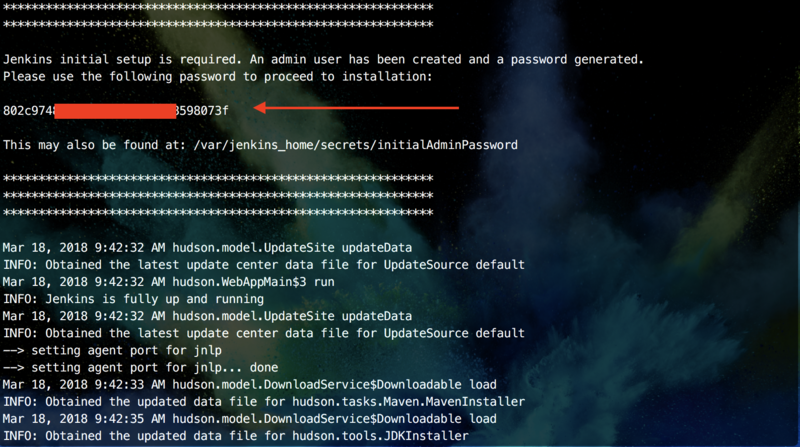 First, I will share with you Docker Hub link from where you can read about how to install Jenkins or second, I will ignore that and I will share with you simple steps which you need to follow to run docker Jenkins without going anywhere else. I am going with the second approach. Now run below command that may take some time ( depend upon your internet connection ). As download complete. You can run your Jenkins by giving below command. This password you can get from the terminal where you gave a run command. After that Jenkins will ask you to install plugins. So for that go with default plugins. 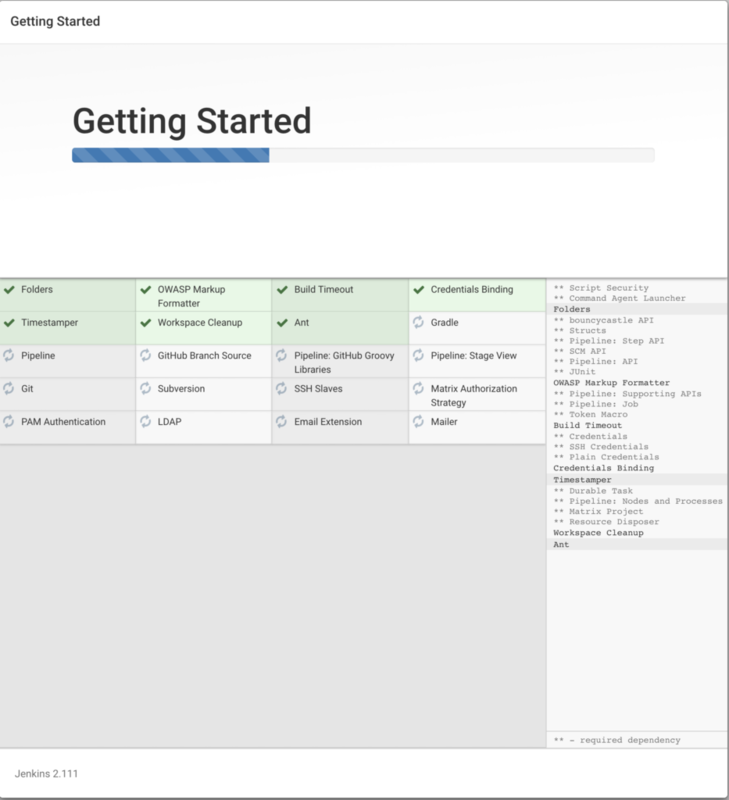 BOOM, Jenkins setup is complete from Docker. So, my friends, you have a good news. Now you know how Jenkins work with Docker. Only you need to run one command. After the execution of the above command. You will get the information related to Docker images as shown below. 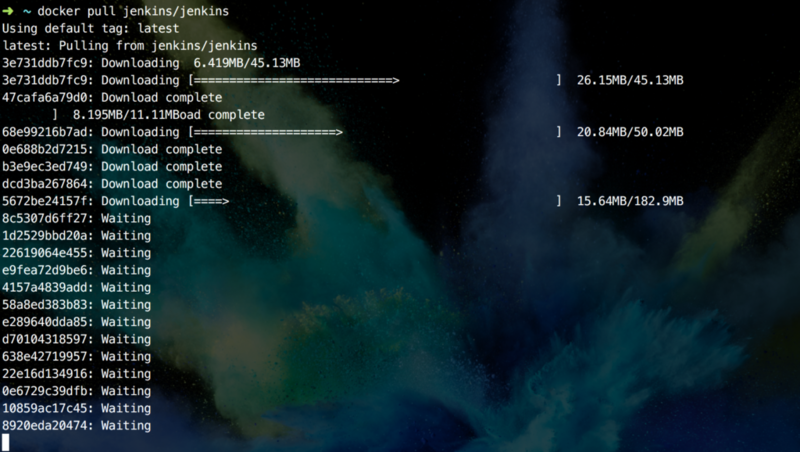 If you have more then one docker images, then try to search Image jenkins/jenkins and copy its container id. Next, run below command with copy container. 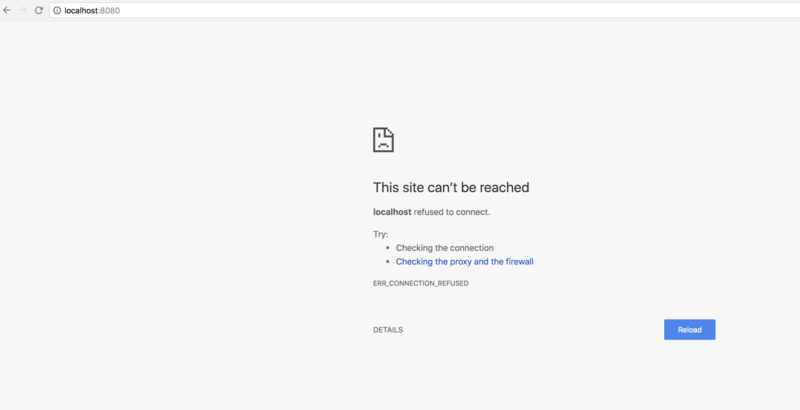 After the successful execution of above command, refresh your browser with localhost:8080 and Jenkins will start working. Now, everything related to Docker is done. For the revision purpose, I am going to make a cheat sheet for you guys. docker pull jenkins/jenkins // Docker installation. 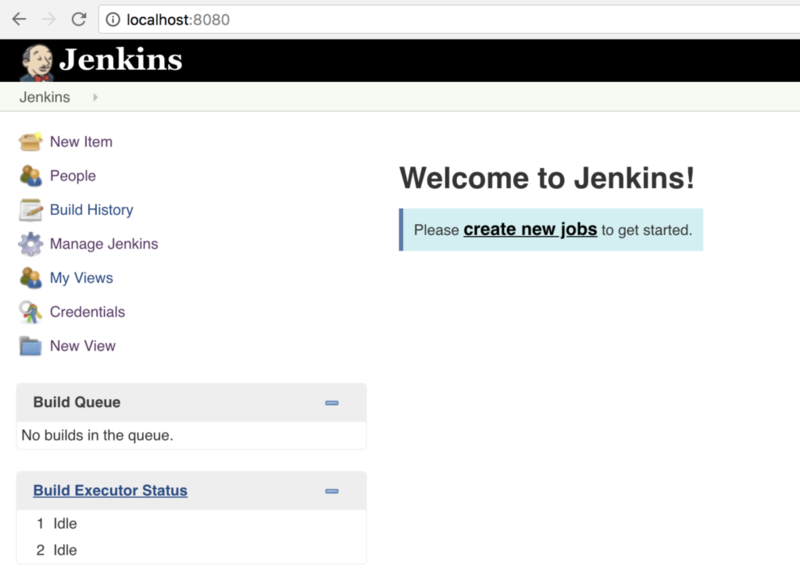 docker run -p 8080:8080 -p 50000:50000 jenkins/jenkins // Jenkins run. docker ps -a // If localhost not working try this command. For our series of posts. We are going to use Gradle which is default Build System for Android. If you want to write any script for this build system you have two choices maybe you can use Groovy language or second is Kotlin. 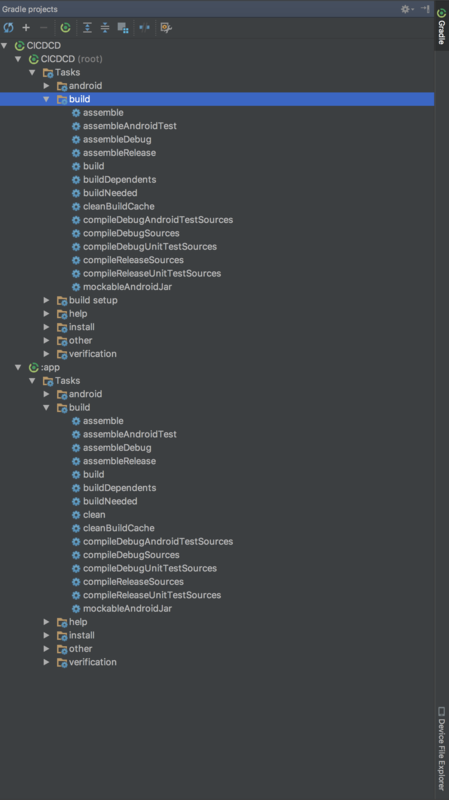 In Android, we mostly add dependencies in a build file. Basically, that is a Gradle file with Groovy language. Here I will share with you some commands related to Gradle which will be useful in next posts. Also, those who are new or they have experience but they are using Android Studio UI for a compilation they can increase there vision by learning these commands. Now, In Android Studio as I want to clean my project mostly developer go to Menu -> Build and -> Click clean. Basically, once you guys click clean, Android Studio in a background run a Gradle command for us. One more command. As we want to build a debug APK we will click on Menu -> Build -> Build APK (s). So you can see as in above image. Once we click, behind the scene Gradle run a command assembleDebug and we got an app-debug.apk. Maybe you are thinking why I am sharing with you this Gradle build command system. So the answer is in Jenkins we will only play with build system commands. There is no Android Studio instead there is no need for Android Studio to implement Continous Integration ( CI ), Continous Delivery ( CD ), and Continous Deployment ( CD ). Instead, we should know commands and how to run these commands. So, it’s time to run one command on our terminal. If you want to learn more about how many commands we have in Gradle build system for Android. 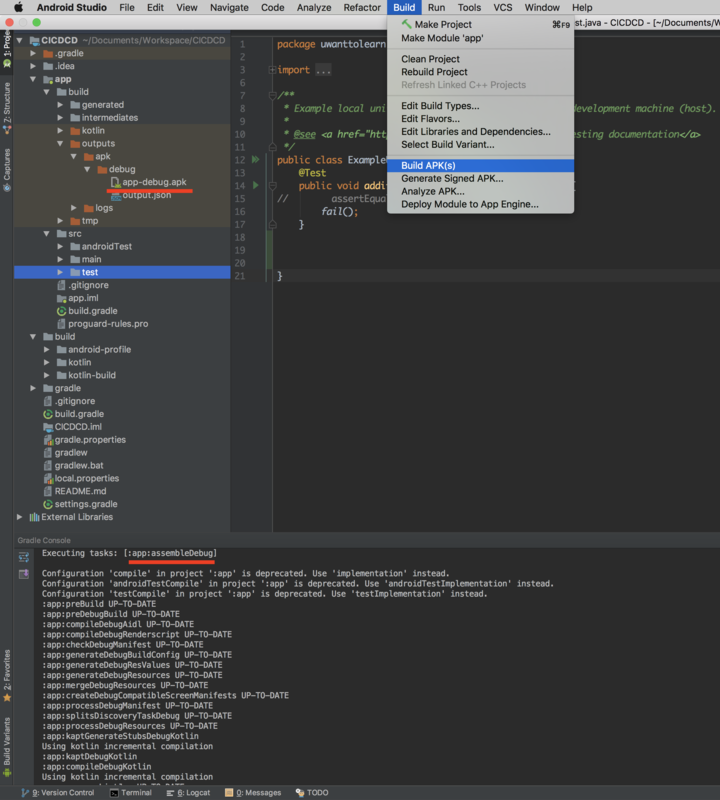 I will recommend you open Gradle pane in Android Studio and see the commands. At last, we finished our first post. We discussed the prerequisites for this series of posts. We discussed what is Continous Integration ( CI ), Continuous Delivery ( CD ), and Continuous Deployment ( CD ). We discussed Version Control System ( VCS ), then Git, and then Git hooks an awesome feature. We discussed Continous Integration Server ( Jenkins ), Installation of Jenkins by using Docker an awesome tool. We discussed Build System ( Gradle ) and we did some example of Gradle build system commands. Maybe some of my reader’s think. This post is pretty long but I really want to clear all confusions which I faced personally, especially if you are new or maybe experienced developer but you are working without any senior team member’s help. I hope you enjoyed this post and you learn something new about your career growth. OK friends, BYE BYE. Thanks for this. How do you keep an incrementing versioncode, potentially across branches and multiple Jenkins jobs (debug/release/flavours)? Neil, Your question will be answered in next tutorials. But if you are doing CI now, then I am sharing with you simple script. Which will be helpful for you. Basically, once you are using this script in your build Gradle for version code. You will get a Jenkins build number if you are running your build on Jenkins and if you are on your Android Studio ( local machine ) then you will get a current time as Int. I hope your question is answered. If not please ask me again I am always available.